Looking to dash out onto the water in comfort? Also hoping to have some fun while you’re out? Paddle circles around the other kid’s adults? Wanting stability and speed? Well the 10′ ERS VII may be something you should look at. It’s versatile, lightweight, it has a simple but nice design and included are some really cool extras. 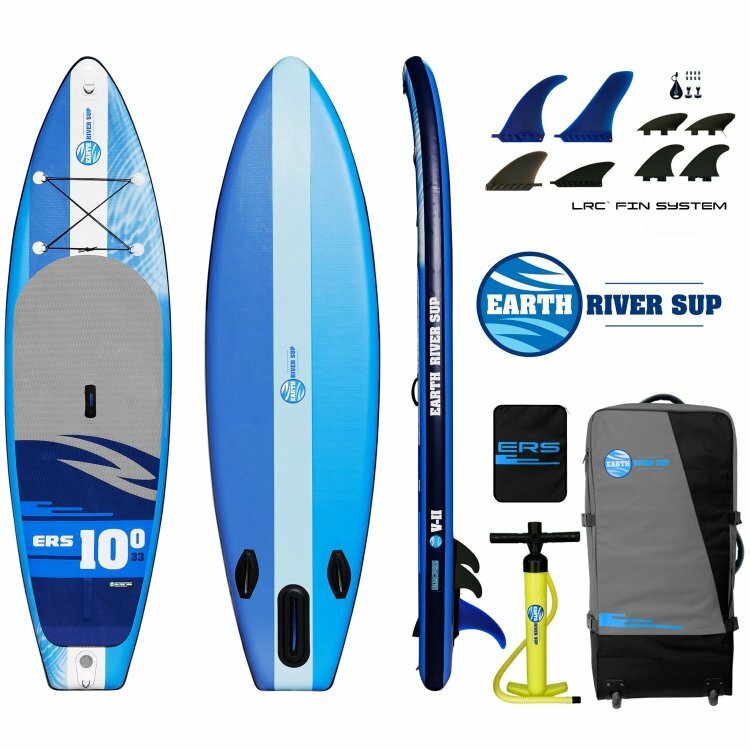 ERS, Earth River SUP has been in operation since 2012 and include an array of long time and professional SUP riders in the team. So when talking performance for the VII, I think of how it performs in a multitude of areas. It, after all, is advertised as being an all-rounder kind of SUP. Inflatable SUPs as a general aren’t ever going to be favorable in the surf, however, can excel in other moving water conditions like rapids. 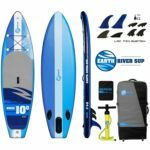 So while I wouldn’t be recommending the VII for beach break surf, I can say it will surprise you at how well it can handle flatwater conditions through to heavier rapids. One of the reasons I wouldn’t suggest it for the surf is the thickness of the board. The thicker the board, the trickier it is to make sharp turns aka turn into waves, so you don’t nose dive. 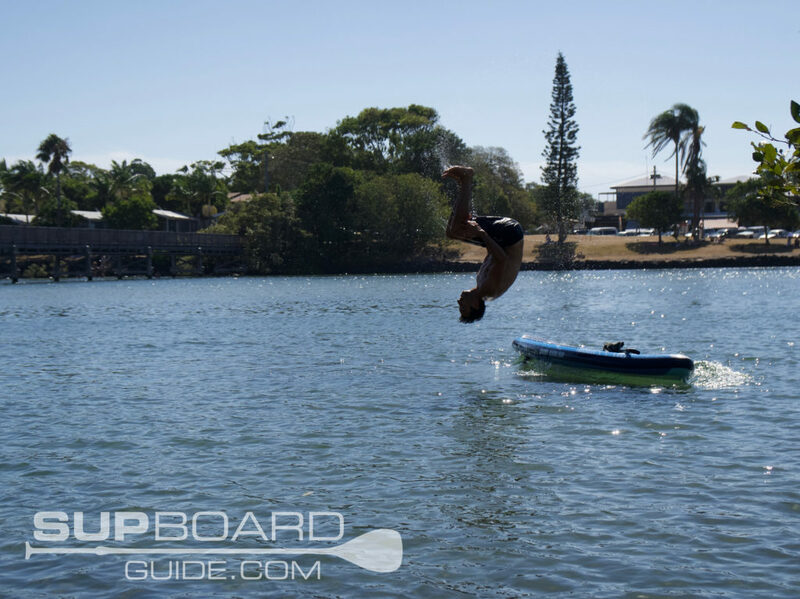 Now the plus side of the having a 6″ board is the buoyancy and stability it provides. So perfect for light to heavier rapids but also ideal for beginners. While it wouldn’t hurt to have made it 5″ thick for that little more control, then it wouldn’t be as versatile for the flatwater conditions/user experience level. I found back step back turns easy and smooth, the squared tail and deck pad providing plenty of traction and stability. While I also noticed the board to pick up speed relatively quickly and hold it’s glide. I swapped out a few different fins and could feel the slight changes in performance but I, unfortunately, had no small rapids/shallow fast waters to go down and test the others. Though from previously testing the same fins on the ERS Skylake I can assure they aid in helping the board move freely. Given the shape of the board (which I’ll go more in-depth with, in the board design below) the tracking is on point. Not only the shape though but the pre-mentioned fins. A decent quality fin will make quite a difference if you know how to feel it. So combining the elements of tracking, stability and generally easy the VII is to paddle, this is a perfect choice for a beginner. Not only a beginner though, but intermediates can easily get enough out of it too. Which means beginners looking for a board to improve skills with and still enjoy it on the other side may have just found their perfect match. Using their Dual Core VII Technology, ERS provide us with boards that are stiff, durable but still lightweight. Essentially what they have done is start with the standard drop stitch core and moved on to wrap the core in a high tensile dual layer PVC. These layers are then thermally fused to best control strength and flex in the board. The deck pad you’ll find on the VII but also all other ERS SUPs is made from a thick rubber that’s about 40% thicker than most deck pads. The extra thickness provides a platform as comfortable as your favorite pair of slippers. As the pump that is included is the same as the one, I received while reviewing the Skylake I chose to test out the new ERS GO Battery and compressor. I will go into more detail about that little bundle of happiness in the accessories part. Inflating to 15 PSI with a hand pump takes about 5-10 mins depending on the amount of oomph going into it. 15 PSI is the recommended pressure; however, you can safely go up to 18 PSI. 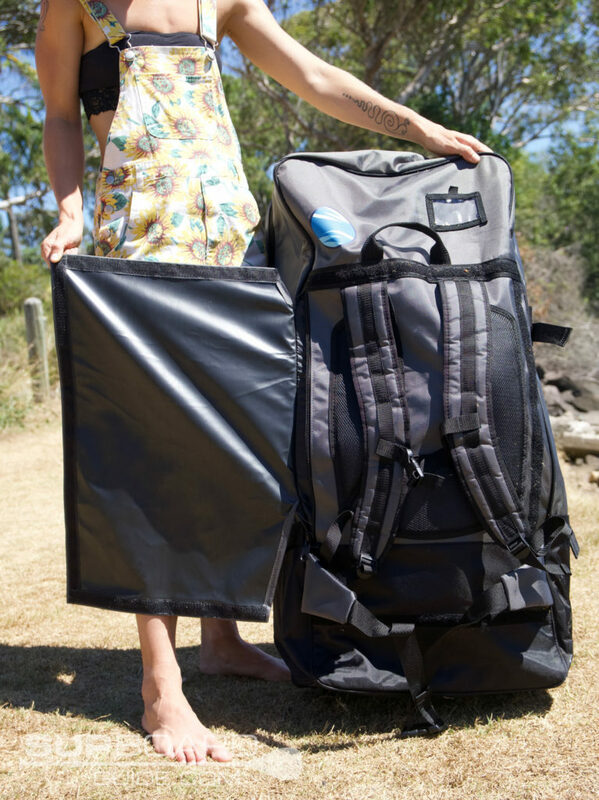 This is especially helpful if the full weight of the rider(s) &/or gear is close to the max capacity of 290 lbs. The board’s design boasts a wide stable standing area with squared off tail for even more stability. The squared off tail also helps aid in turning the board if doing back foot turns. It makes it easier but is a little slower than a pintail shape. One thing to argue though is squared tails offer easier precision turns for beginners. Traveling up the nose you’ll notice the curve the board has, this is the rocker. The rocker on board plays a part in how it handles in chop, waves, and winds. 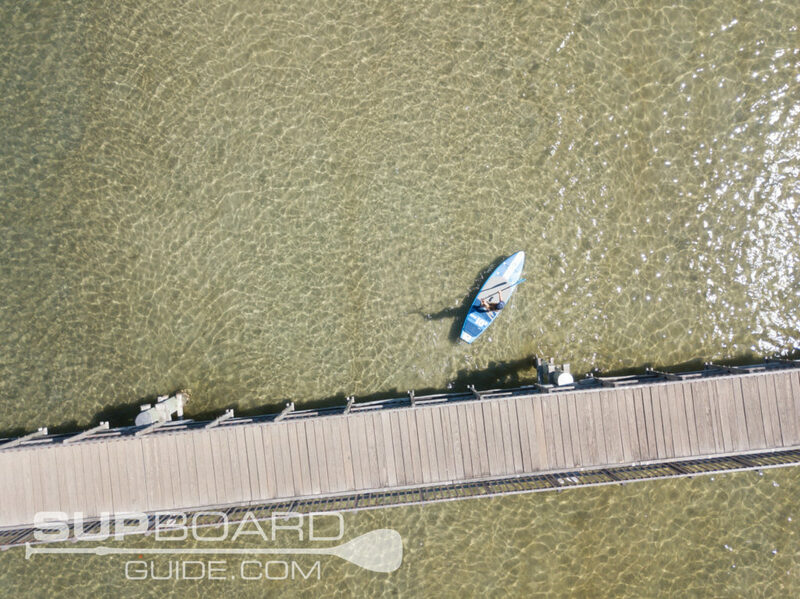 An overly pronounced rocker, it’ll be slow to paddle on flat water, but no rocker means a slight change in conditions will make for a tricky paddle too. On the V II, there is a nice balance between too little and too much. Aesthetically speaking, I like the colors. The shades of blue with water ripple graphics is a little different to anything else I’ve seen and has you standing out on the water. I definitely enjoy the deck pad being a grey color too as white gets dirty too quickly! 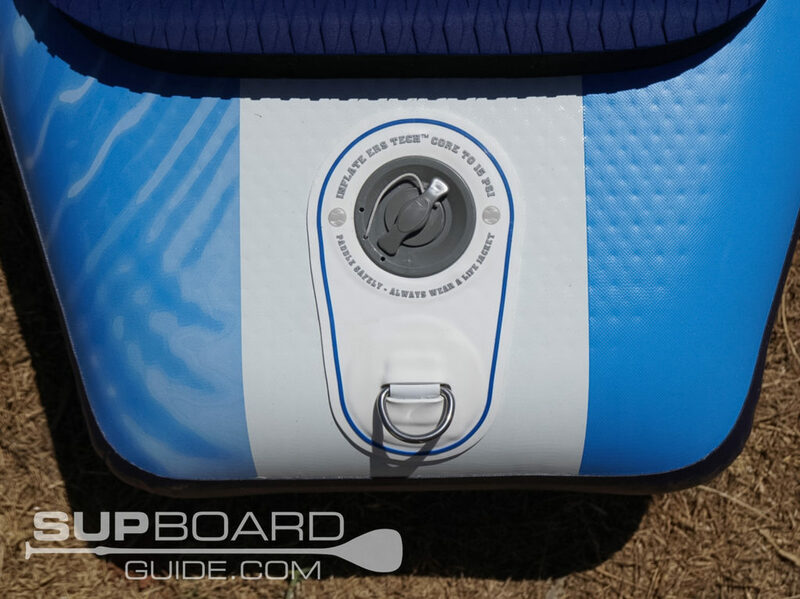 On the nose, you’ll see the 4 D-rings with a bungee cord, a great spot for storing some goodies or even to secure your paddle while you swim! I always think there’s a need for more storage because I like to go out for a few hours and take lots of things, snorkel, camera, jacket, hat, etc. But most people don’t need more than what’s supplied on the VII. Further back, at the tail of the board is another D-ring to attach your leash which you get for free if you purchase through Pumped Up SUP! (Read the top of the page). The paddle you can get for free* currently is a fiberglass 3 piece pull apart, that weighs 2lbs. It’s got a sturdy blade and floats! They also put a bright and stand out print on the blade for easy spotting just in case you do drop it. Of course, there are stronger, lighter paddles out here but not for free! The pump included isn’t the most crash hot hand pump you can get, but it gets the job done. 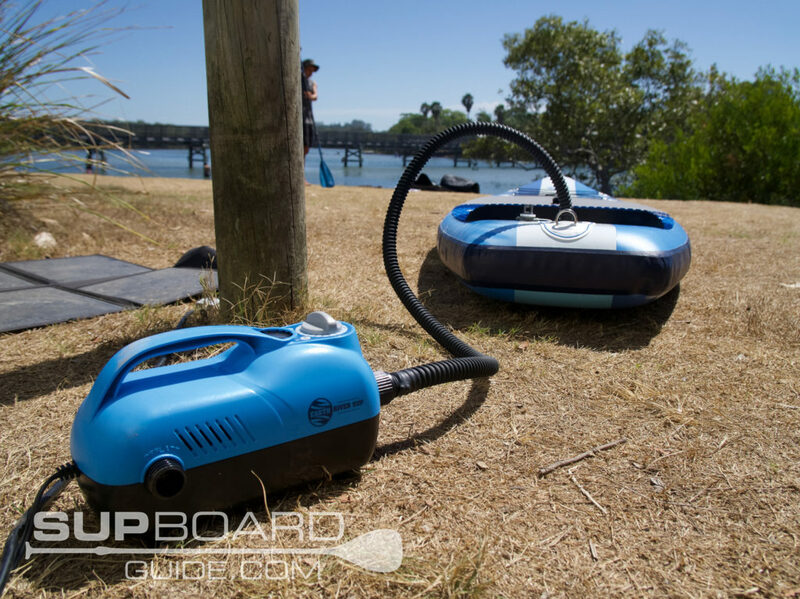 Most people who SUP regularly end up buying a compressor. 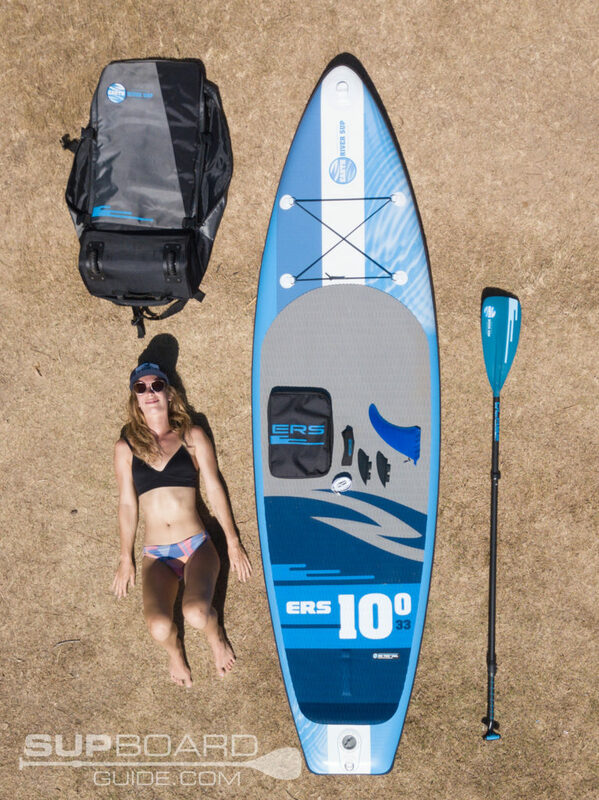 Now, again if you head over to PumpedUp SUP, they are offering the ERS compressor for almost half the price if you purchase an ERS through them. If not, the high-pressure pump you’re supplied with still see you through. It’s got the efficient option of being dual action. What is that? It means you can inflate on both the pull-up and push down. You can keep an easy eye on the pressure on the reader up top, and I found there to be no leaks in the hose! Overall for this type of hand pump, it’s efficient and good quality. The fin package is as good as it gets. I don’t think I even knew I had a bit of a fin obsession before this, but it’s made me realize I do. You get 4 types of center fins and 2 types of side bites. Made for all types of conditions. But whyyyy? It does really make a difference! And no one else is really thinking to include these high-quality options. So it makes a huge impression on me at least. Your fins are like your transmission. Are you automatic or manual? 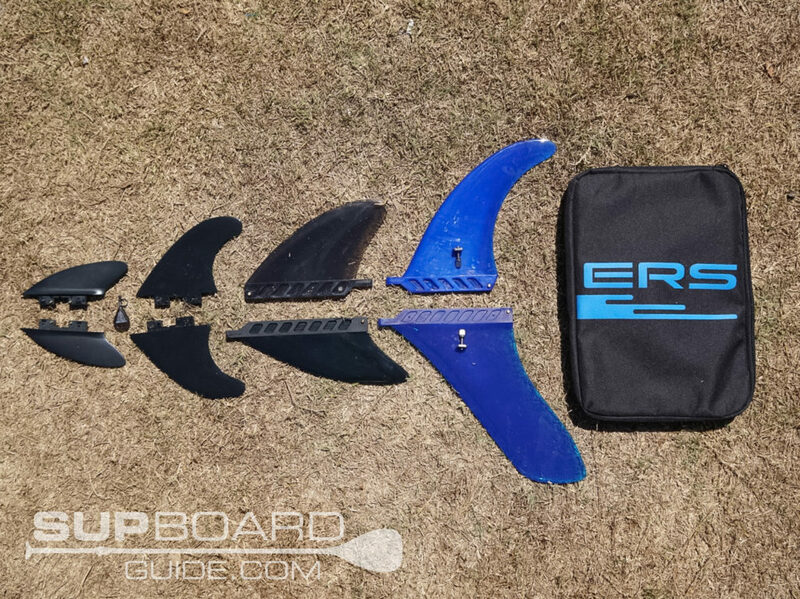 High or low gear…A big center fin for tracking and glide or some low profile sleek fins for shallow waters and loose turns? 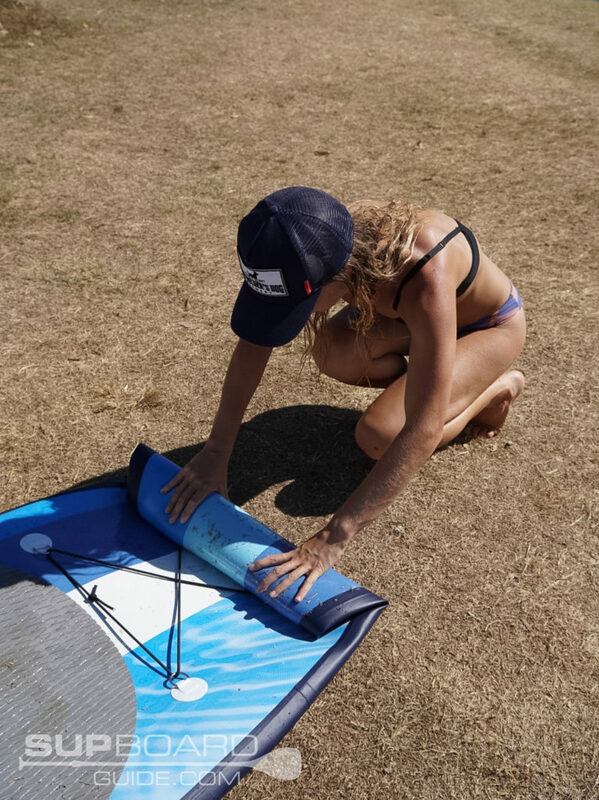 It’s like a choose your own adventure every time you inflate your board. Am I getting my point across yet? They are awesome! Using a US fin box also means you can place the fins where you like. You can move them up and down the box, and it will change your turns, glide, and stability. I could rant at you about all the type of fins but that’s almost another review in itself, the best way is to just change them out and get a feel for it yourself. Also not included but again, free* if you purchase through the link above. A coiled leash with a secure and comfortable ankle strap. Somewhat comforting if you are going out in conditions that are a little trying or even just a beginner finding their feet. Roll on through…I do love a backpack with wheels. And tough wheels. The kind that doesn’t have to just stick to airport floors. Aside from the convenience of wheels, the backpack also boasts very comfortable straps. You can drag, wheel or carry this bag around and it feels sturdy! There are no rips yet present for me, and my bags do take a bit of a beating from time to time. Inside there is heaps of room, so no origami, pretzel maneuvers required to get your board back in. Inside, there is a nice little strap to hold your board in place. I also just like the look of the bag, looks almost corporate. Of course, what is a complete SUP kit without your little orange tube to help you along the way? Not that I’ve ever needed to use one in my history of inflatable SUPs. It’s always nice to know that it’s there though, so in case of puncture, you have some patches but also a valve wrench tool for leaky valves. The VII has my tick of approval (and you all know that I don’t always give that tick!). I love the versatility of fin options and so will you! It’s built well so that both beginners and intermediates will enjoy their time out on the water. Not only is it an incredibly versatile board, but it’s also made well. Sometimes it’s hard to tell the difference between a well-made board and cheaper produce. The thing that stands out here for me is it’s lightweight, but it’s strong and rigid. Which tells me high-quality materials have been used. Cheaper you may get a lightweight frame but also flex. Then on the other end, too heavy will weigh down the performance. And not to mention the value! Especially if you purchase through our link at the top, you get an AWESOME deal with free paddle and leash. For those on a really tight budget and don’t mind sacrificing performance/durability, you can look at the Gili Air as probably the only viable option in a low price range. If you are happy to meet halfway, iRocker All-Arounds are an exceptional board and hold huge value.